PaperDesk comes (unlike any of the other apps) in a free ‘lite’ version on the app store, so it may be worth a try to see if it fits your needs. Unfortunately, inking is not very smooth. There is a nice bookmarking feature, and a nice to-do feature including the ability to review all to-dos from multiple notebooks on the home screen. However, the to-do’s do not sync to a particular page in a notebook. Exporting to PDF requires connecting to iTunes. There is no Evernote integration. Paperdesk does have the ability to export directly to Google docs. It also includes the ability to use typewritten notes. Typewritten notes, unfortunately, do not wrap around hand written notes and ink almost seems to be a secondary input choice. The keyboard has a nice quick access toolbar for tabs, bullets and math symbols. Palm protection, the ability to keep your wrist or palm from creating extraneous and unwanted marks on the paper, is weak. The icons and general layout are somewhat goofy and not at all iOS like. There are no discrete settings or preferences. Photos can be imported either from the photo library or the camera. PaperDesk also includes the ability to record voice notes. However, the keyboard obscures the record button, making it difficult to begin and end recording. Sounds are actually linked to the typewritten words making it quick to jump to any particular point of the recording. For example if you typed out “four score and seven years ago” while recording, and then clicked on the word years, the audio would begin replaying whatever was spoken or recorded at that particular point when the word “years” was typed. This is similar to the functionality contained in other programs such as Soundnote for the iPad, and also replicates, to some extent, the functionality of having a LiveScribe pen. Unfortunately, the recording does not track handwritten notes and tracks only typewritten notes. Ghostwriter ($4.99) notes allows you to take notes either with pen or by typing on your iPad. The interface is much better than that of PaperDesk. There are a number of different papers which can be used and custom papers can be made from anything contained within the iPads photo album. PDFs can also be imported for annotation and markup, a great feature for filling out things such as standardized intake forms. Interface is relatively clean and straightforward, iOS like. Export options are plentiful, including the ability to export through e-mail, Dropbox, Evernote, directly to a PDF viewer, by printing wirelessly to printers capable of communicating with iOS, as well as sending the note page to the iPad photos album. GhostWriter allows the user to insert blank pages into a notebook, and reorder the pages as you see fit. Each page is given the default description of the current date, but each page can also be renamed to a custom page name. There are, of course, a variety of pens, pencils and highlighters for use within the application. Unlike PaperDesk, there is no audio recording with GhostWriter. GhostWriter employs a zoomed handwriting feature. This allows the user to write with much greater detail than would normally be possible using a stylus or finger on a blank page. However, the ink contained within the zoom box is somewhat pixelated and difficult to read. Penultimate ($1.99) is perhaps the most iOS like of any of the applications. It is brutal in its simplicity which, depending on your view, is either the highest selling point or the biggest drawback. Penultimate has outstanding pen to paper feel, with the ink flowing smoothly across the page. It incorporates very, very good palm protection. Photos can be imported from either the iPad’s photo album or directly from the camera. Paper is limited to 3 styles, although additional styles are available for both free and via in-app purchase. The main drawbacks to Penultimate are limited export opportunities. Entire notebooks or individual pages can only be exported as PDF files or as native Penultimate files and only through e-mail. Individual pages can be saved into the iPad photo album or printed via iOS capable printers. Overall, Penultimate is a beautiful app, accurately recreating the simplicity and presentation of a pen and paper notebook. Note Taker HD ($4.99) is perhaps the deepest of all these applications. The best of these features include the ability to select, cut and paste handwritten text, the ability to tag, flag and mark favorites for individual notes. Also, Note Taker HD can directly import PDFs and then mark them up. As with GhostWriter, this can be very handy for creating forms you want to fill out. Of course, to some extent, this inevitably results in duplicate data entry, the bane of the computing world. Note Taker HD also incorporates a zoom feature for creating handwritten notes. Again, this allows a great deal of detail and precision when writing in the Zoom box that is reflected on the full page. The handwriting this passable, but not quite as smooth as Penultimate. Additionally, Note Taker HD lacks the ability to directly connect to Evernote. Finally, note taker HD is a somewhat complex piece of software is a trade-off for the depth of features. Although the layout is nice and presentable, it can be a bit offputting and somewhat counterintuitive at times as it diverges from standard IOS interface. Noteshelf ($4.99) has truly amazing handwriting/pen and ink response. It also incorporates a zoom feature which allows, again, precision handwriting. The ink on the page is comparable to Penultimate. Noteshelf allows for palm protection to avoid inadvertent inking on the paper. The interface and layout is very iOS like, very intuitive, and customizable for lefty versus righty. There is a direct Evernote export. As well as Dropbox, iTunes, e-mail, iPad photo album, and print to iOS capable printers. Export format can be set to go as either individual images for each note page (which is the best way to export to Evernote as the handwriting will be recognized and then searchable) or as multipage PDFs. Page navigation is very nice and intuitive with a thumbnail drop-down for each page. Individual pages can be rearranged and reordered and individual pages can be moved/copied between different notebooks. Downsides to Noteshelf include the inability to import PDFs for annotating. Also, custom papers are, as with Ghostwriter and Penultimate, a separate in-app purchase for additional money. Photos can be imported directly from either the camera or the iPad’s photo album. It’s a close call between Noteshelf and Note Taker HD. Note Taker HD has some superb features and is well worth considering if you need to fill out for right on top of an markup individual PDFs. However, if you want great inking ability, excellent export options, and ease-of-use note shelf is the way to go. If, on the other hand, you want to recreate as closely as possible plain ole’ pen and paper, go with Penultimate. This is not an all inclusive list of note taking apps which use ink, just a review of those most frequently mentioned. Noterize sorta gets you there, and is free, but the inking isn’t that great although the app does do audio recording. Notes Plus is a nice effort, allows mixed typing and handwriting, as well as recording audio. But, the ink feel is a bit jerky, the export options and paper are both very limited as well. A word about styluses (styli?). Writing on the iPad with your finger will quickly become unbearable and unworkable. If you want to take handwritten notes, you will need a stylus. The Pogo ($10.98 Amazon) is workable, but has a spongy tip on it. The Kuel H10 ($12.99 Amazon) has an excellent tip which is nice and as precise as can be with a capacitive touchscreen such as the iPad has. Unfortunately, the Kuel 10 is also a stubby little bugger. I resorted to modeling mine by pulling the rubber grip off a regular pen and also extending the length by sticking an extension on the Kuel 10. Update: Received a Jot stylus from Adonit ($19.99) last night… by far and away the best stylus out there due to the length. Because it has a ‘hard’ tip, as opposed to the rubber and sponge of others, it does tend to make a tapping sound on the glass as you write. But, the Jot is a full-length, well balanced device. You ‘can’ make your own free Jot disc-style stylus if you have the time and DIY attitude (web page link, YouTube link). Why would you want to make your own? Because these things (stylii) get lost, because you want to use an old-well balanced pen you have lying around, because you’re cheap, because you’re a tech-head pioneer and slide rulers, pocket protectors and thick rimmed glasses have all gone out of style. try the Jot stylus from Adonit, a dream! Great review, and you’ve turned me on to Noteshelf–I’ll have to take a look at it. Have you given UPAD a try? It’s not often mentioned, but I’ve found it to be my preferred note taking app. The handwriting ink is quite nice, knocking Penultimate to the ground. I’ll be curious what your thoughts are if you give it a look. It’s worth noting that UPAD comes in a ‘lite’ version and is certainly worth a try. UPAD does stack up well in inking against the others. If you are looking for a freebie, UPAD definitely takes the lead. How can Evernote not be included on this list? It is the first one I started with and still the default note taking app of choice. I am glad that someone else does like Noterize. We use it as our note taking app for one of our classes that is one to one ipad and works really well. I use about five to seven apps to take notes depending on what type of notes I am taking. If I am lookijng at the web and taking notes, I tend to use Scratchwork. If I am including drawings with my notes, I use Penultimate. If it is text notes and I have my keyboard with me, I use Evernote. Great review. I’ve always used Note Taker HD, if only because it was the forst note-taking app to incorporate a zoom box, which allowed me to easily take notes for hours during court. However, the updates made it worse – now, there’s fpur stepa just to send to Dropbox. Very un-iOS. I will give Noteshelf a try, and I agree with Pete about UPad, another fine note-taki app. I have reviewed all of these note taking programs and more. IMHO, UPAD and Penultimate are the best because they give the best writing experience. I use UPAD. Try the Bamboo stylus for something much better than Pogo. It has a hard rubber like tip that glides well and is not squishy like the Pogo. I got mine from Amazon. How is it that Bamboo Paper from Wabco isn’t in this list. I have every one of these products installed on my iPad2. All but a couple I keep in a folder reserved for “writing tools I’ve tried but that didn’t make the cut”. If fast, accurate ink rendering and realistic, smooth pen-to-paper feel is important to you, nothing beats Bamboo. There’s a definite lack of advanced features, but their handwriting algorithm is second to none. Penultimate is very close in this department, and has a few key features bamboo doesn’t, but has a sufficiently noticeable lag in rendering vs. Bamboo. Bamboo is fast, and a pleasure to use, and it’s pinch zooming feature is definitely worth a look. I do agree that Noteshelf is also a good choice, but the handwriting accuracy, speed, and appearance just doesn’t measure up to Bamboo (or Penultimate). Great article, and good comments. Settled for noteshelf, and couldn’t be more pleased with it. I would try the educreations app. It is not strictly designed for note taking but its pretty amazing for that function and its free. The plural of stylus is “styli” and not “stylii” because radius already has an “i” in it, which is why there are two in the plural form. Plural forms of these kinds of words that end in “-us” change only the “-us” to “-i” in the plural form. One radius becomes two radii. One focus becomes two foci. One stylus becomes two styli. Would recommend re-visiting both Noteshelf and Notes+ as they both have recent major upgrades. Notes+ has lost all the instability it previously gained after the iOS5 update and the writing smoothness has improved markedly. I like the shape recognition and the ability to select and move chunks of text/drawing/handwriting around on the page. Noteshelf has also had a number of nice new features and improvements, including its writing smoothness. Both now include the ability to import PDFs, although I still prefer GoodReader as a PDF reader and annotation app. Notability has replaced Note Taker HD for me, it has a very similar feature set but everything is smoother and more streamlined. For sketches of user interfaces etc. I use Penultimate for its outstanding pen rendering, but based on these comments I’ll have to give UPAD a try. I like Notability a lot as well. My current favorite note taking app is GoodNotes. It has a really clean interface and the zoom box behaves in a very natural way that makes handwritten notes a breeze. I greatly appreciate all the comments in this article. 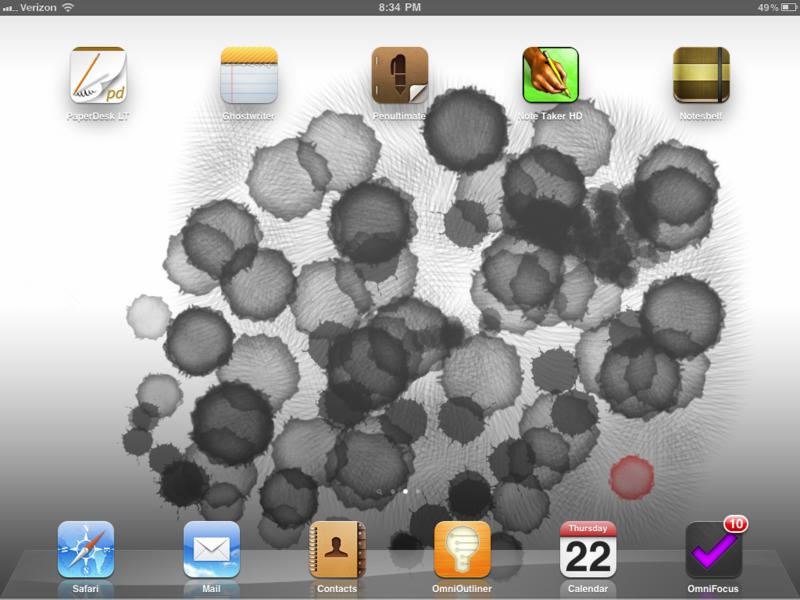 I plan to check out NoteShelf and some of the others mentioned. I have been looking for that optimal in meeting note taking app. I like to be able to pre-load my agenda and any documents associated with the meeting into one notebook and then insert blank notebook pages for notes aside from those on the documents. In an ideal world it would be awesome if my handwritten notes could easily be converted to text, if I could import and annotate upon .doc, .ppt, .xls, and .pdf’s, if I could export individual pages or an entire notebook to dropbox, email, etc. An added bonus would be voice recording that jumped to the spot with accompanying notes like with a LiveScribe pen. I started using PaperPort notes recently and like that I can insert pages among my imported documents, I have a variety of paper styles to choose from. Recently it added a dragon dictation option as well, which I haven’t tried yet. For the most part I’m pretty happy with it, but the handwriting is not as smooth as I would like and as a lefty, I get palm interference regularly when writing and have to reselect the pen. I liked the writing ease of notability, but didn’t like the inability to insert pages into the imported document. I also couldn’t figure out how to add more pages to an existing notebook – it can’t be that jhard, not sure where that feature is though and the intro doesn’t say and the only way I have gotten it to go to the next page is with the keyboard. In the Upad lite version I have been impressed by the quality of the handwriting, but I do not like that I cannot integrate a memo pad for notes with a book pade for annotations, if someone could tell me more about that type of integration I might be sold more on Upad, but I don’t want to have look in different notebooks for handwritten notes on a page vs notes on a document. I had a recommendation to also try Ghostwrite so based on their latest updates I may have to try them again. Hands down, after buying and testing several different apps, Noteshelf takes the cake with the Bamboo stylus. Notability does have the best syncing features with Dropbox, but in terms of comfort and smooth writing and organizing notebooks, Noteshelf combines the best of all of the other apps in one (especially the Penultimate style writing). I’ve been through numerous note taking Apps compatible with a stylus. So many amazing Apps but now have a Winner. My needs were simple- ease of use, good flow with stylus, key pad option, optional notebook set ups, ink and paper options, palm guard essential, erase page feature. You could create the perfect note taking App by taking the best bits and combining them. • Penultimate- Quality, great design and features. • Notes Plus- as good as Penultimate, quality App packed with features. • Good Notes- Love this App. I borrowed down the vast selection to two and this came second. It’s well designed and simple to use. Not over complex like a few others -Theses developers knew when to stop! WINNER- my favourite and recommendation is UPAD. It took me a few weeks to arrive at this conclusion. Try the lite free version before you buy. It’s user friendly, plenty of options with out being over designed. Works great with Stylus . It’s got everything I need to take notes at meetings and replace note pad and paper. thanks for the article – it covered a couple of apps I hadn’t see reviewed else where. One question: I didn’t see it listed, but do any of the apps offer text conversion of handwritten notes? I thought I had seen it in another blog, but can’t seem to remember which app it was. interesting round-up, mainly focused on inking note app. you should have a look at Beesy, http://www.beesapps.com/beesy-ipad-to-do/, interesting way to address the problem of business meeting notes. Interesting as well to generate automatic To-Do from your notes and follow-up on them. For my part I use the iPad for 2 years. I’ve been using Evernote for a while its ability to sync but it lacks features to accommodate tasks, to-do and make monitoring. It’s been a while since I seek an alternative because it would save me some time every day. I have tested almost all the apps on Notes / todo on the AppStore and I must admit I am always surprised how little they correspond to a profes. I just discovered Beesy, an application note taking and management To-Do, which apparently included http://www.beesapps.com/beesy-ipad-to-do/ taking notes with a business angle. I been trying for several days and for now I am positively impressed by the application. It is powerful to see a little too early. I love the shortcut icons to quickly and easily add notes and the ability to easily send the minutes of the meeting. Donna- I have the same requirements. I have a major need to convert handwriting to text. Once I have my notes in text format, I can do search across notes/documents. Anyone – any good suggestions? Could you please post the link for the DIY jot stylus? Here’s a YouTube video showing how to make your own DIY capacitive see through stylus for the iPad. I just found Pencilicious — it has great organization and ink. More editing flexibility than most as well. Noteshelf has been my go-to app for a while now, although Notability is also great. Penultimate, while brilliantly simple, is getting surpassed by some of the new entries. A good article – I have used a few of the apps you describe (Noteshelf, Notability, Penultimate) – but you haven’t mentioned my favourite, ZoomNotes. They have recently brought out a new version which includes lots of new features, like typed text. The best thing about it is its unlimited zoom. There is also a free version now I think. Excellent review. I just bought Noteshelf. I already had various free ones (Tactilis, Draw Pad, MindJet, Idea Sketch) but none were enough all-rounders to make me properly use them. Also I needed integration with Evernote. Have now started using Noteshelf. 1st impressions are good. Would be interested to hear from long term users…? I have been using both Upad and Noteshelf for over a year now and though Noteshelf is excellent for the creation of books, Upad is definitely the app for handwriting and for me, as a Maths teacher, it’s the app to use for both myself and my students. I recommend an app called NotesDeck.